Stick welding with a tig torch. (about stick welding with a tig torch) that can't be good to do to your TIG gun! Do you still use the foot peddle? ------------------------------- I don't use the tig torch to stick weld very often but I have before and it got me out of a bind a few times . I remember once when I needed a portable welding machine and the only one I had was a little Miller Maxtar 90 tig unit. It only had 90 amps of power but that was enough to burn a 3/32 7018 to weld a grated floor back down that had been bent by a forklift. It worked great and didn't hurt the tig torch either. I only had to burn one rod. 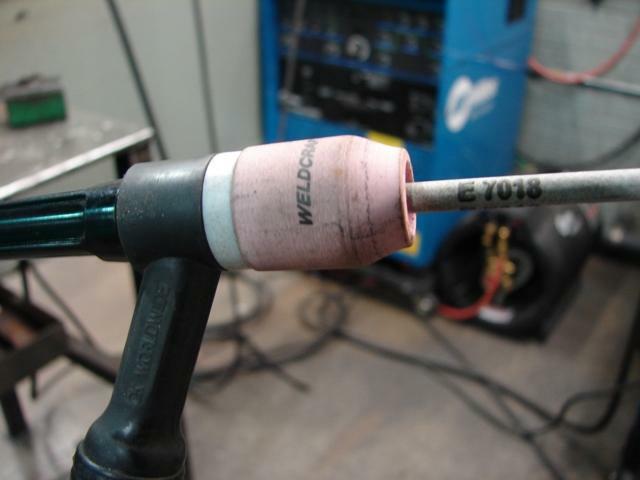 I suppose if you were to stick weld with the tig torch every day and burn the rods all the way down to the nub you might burn up the collet body or ceramic tig cup but in a pinch, if you just need to burn a rod or two, no harm. I have used the food pedal also and it works great too. Especially on thin stuff. One tip though is to make sure to turn the high frequency to the off position or it will arc right through the side of the flux on the stick rod and might flash you when you are not ready. Another caution for those with water cooled torches: make sure the coolant is on same as you would for tig welding. Some Miller Syncrowaves still have solenoid valves for the coolant that only kick on when the foot pedal is pressed.